On 9 September 2015 Queen Elizabeth II becomes the longest-reigning monarch in British history, breaking the record held by her great-great-grandmother Queen Victoria. As the Queen marks this milestone we asked you to share your "moments" with her from the past 63 years. Here is a snapshot of 63 of your memories, one for each year of her reign. Image caption Lynne Sherman (in the dark coat and beret fourth from left) saw the Queen when she paid a visit to Brentwood School in Essex in 1975. She said: "I remember being fascinated by how beautiful she was and I loved her shoes!" 15. Jo-Ann Mandat from Ontario, Canada was dancing at a show in Toronto in the 1980s when she met the Queen. 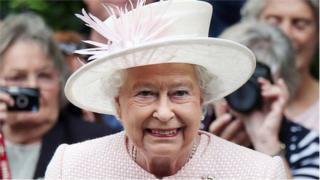 After the show she said Prince Philip offered to take her back to England in his suitcase! Image caption Not everyone manages to take a selfie with the Queen, but Elliott got to grab a quick snap while she was on a visit to Chatsworth in Derbyshire. 22. Anna Powell from Manchester, England says she was almost run over by the Queen as a five-year-old, while walking with her parents in Windsor Great Park in 1985. 23. Rosie Atkins met the Queen at the Chelsea Flower Show in 2000, when a borrowed mobile phone rang in her pocket. The Queen said: "You had better answer that, it might be someone important!" Image caption I escorted the Queen through the Archaearium Museum in Jamestown, Virginia, US. After my curtsy was photographed I received a letter from an individual in Louisiana upset that I, as an American, should curtsy to "the Brit Queen." Bly Straube, who has dual US British nationality, pictured here curtsying. 31. Jack Irwin from Dublin met the Queen when she visited Ireland in 2011. "She wished me the best of luck with my studies, while the Duke was his cheeky self getting laughs galore with his commentary." 34. The smile she gave me was that of a grandma who hadn't seen her grandchild for 20 years. It lit up the room says Dr Julia Malkin from Leicester on receiving her MBE in 2011. 39. Can you lie to a Queen? Paul Harman from St Albans faced that dilemma: "The Queen asked me if the rose I had given her came from my garden. It hadn't - someone in the crowd had given it to me to pass to her. Can I lie to the Queen and say yes? Because otherwise I'd have to admit I hadn't brought anything to give her!" Image caption When my mother was ill and dying of cancer, HM made a point of making an extra special effort to come over to speak to her everywhere we went. Sheila Clark from Glasgow (pictured) has met the Queen on many occasions. 41. Elisa Boccara comments on Facebook that she saw the Queen driving around in the grounds in Windsor, she added "I did not meet her as such but still it was cool". 43. Jessica Ferris's dad wrote about their meeting with the Queen. Jessica and her sister started wailing in stereo just as the Queen walked past on a visit to Portsmouth. The Queen gave a look and a sympathetic smile that only a mother can give. Image caption On a visit to eastern Slovakia the Queen was given a white water rafting paddle and allowed to start an ice hockey game by throwing a puck onto the ice. Eva Maliskova from Levoca in Slovakia met the Queen during her visit and took this photo. 47. Roger Davey met the Queen in Adelaide, Australia said "After meeting her I wanted to explore beyond the very remote sheep ranch that had been my life up to that point." 50. Annette Holden said on Facebook that she had met the Royal Family on many occasions: "In the mid to late 1970s my parents ran the King's Head in Great Bircham, near Sandringham. There was a Lodge on our grounds they used for shooting parties." Image caption Sophie Levy (holding the blanket) met the Queen in November 2014 in Berkshire, England. It was her first royal appointment as one of three Lord Lieutenants cadets. 58. When the Queen was introduced to me she responded "Oh we have a Commonwealth Association of Architects too?" Tony Godwin former executive director for the Commonwealth Association of Architects. Image caption Mark Haldane wasn't able to meet the Queen but he did see her arrive to open the Technology and Innovation Centre at the University of Strathclyde in July 2015. Image caption Patrick and Sarah Collins show the Queen their First Touch Garden at the Chelsea Flower Show in 2013. First Touch is the charity for the neonatal unit at St George's Hospital, London, England. 63. And finally... Carol Boyd hasn't met the Queen yet but she's hopeful: "I'm hoping to see her open the Borders Railway on 9th September (when she becomes the longest reigning British monarch)." Watch this space!